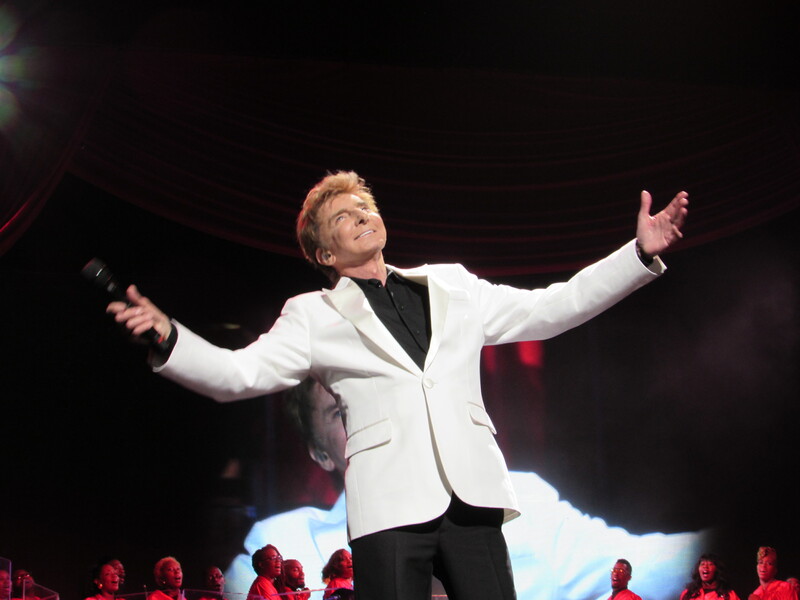 Last week Barry Manilow ended his One Last Time! tour. I was fortunate to see and meet him twice on this tour. First in LA and, most recently, in Philadelphia. It was fitting that I saw and met Barry, supposedly for the last time, in the same arena where I saw him for the first time back in 2007. I say supposedly because Barry just announced today that he’s going to visit more cities on this tour. My fingers are crossed that he decides to go to Atlantic City or another nearby destination on the second leg of this tour. But I digress. Let me tell you all about his show in Philly. With Vikki and Kirsten at the Copacabana pre-party. When I arrived at the Wells Fargo Center I was greeted by Kirsten, who runs Barry’s Platinum meet and greet experiences. She’s also the Director of The Manilow Music Project. Anyway, Kirsten, remembering me from LA, gave me my Platinum badge and I was escorted through the empty arena. Realizing that there was no line at the merch booth because no one had been allowed inside yet, I decided to buy my t-shirt at this time and headed up to the Copacabana party. While I wasn’t very hungry, it was a nice event with an open bar, a variety of finger foods, feather boas, and glow sticks. As the Copa party started to wind down, Kirsten retrieved me and 11 other people to line up and get ready for the Platinum experience. We were led to the VIP and Meet and Greet area, where we received champagne, a copy of Barry’s new album, a glow stick, and instructions as to how the meet and greet with Barry would go down. 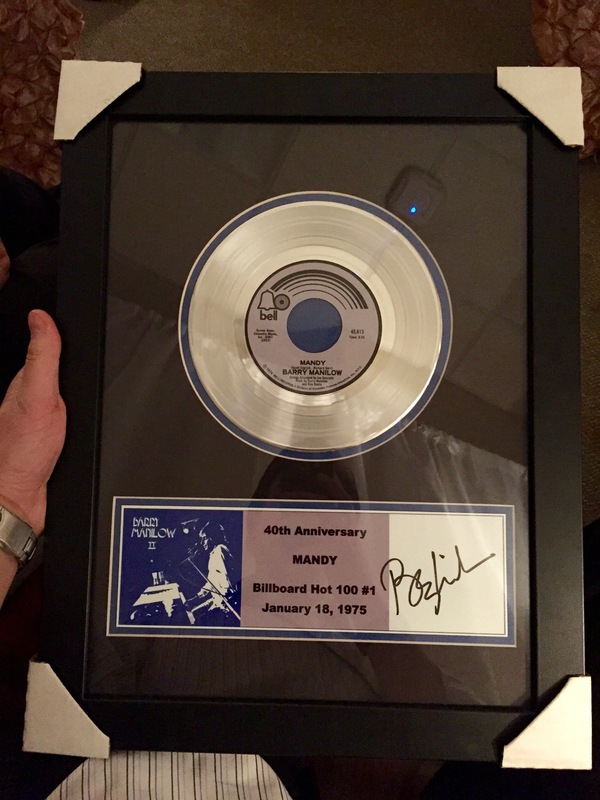 We were also shown the beautifully framed and autographed platinum record we’d be receiving in the mail, commemorating the 40th anniversary of “Mandy” hitting #1 on the Billboard charts. Mine just arrived yesterday and it looks terrific, as you can see from the photo below. I came to this meet and greet with prepared. 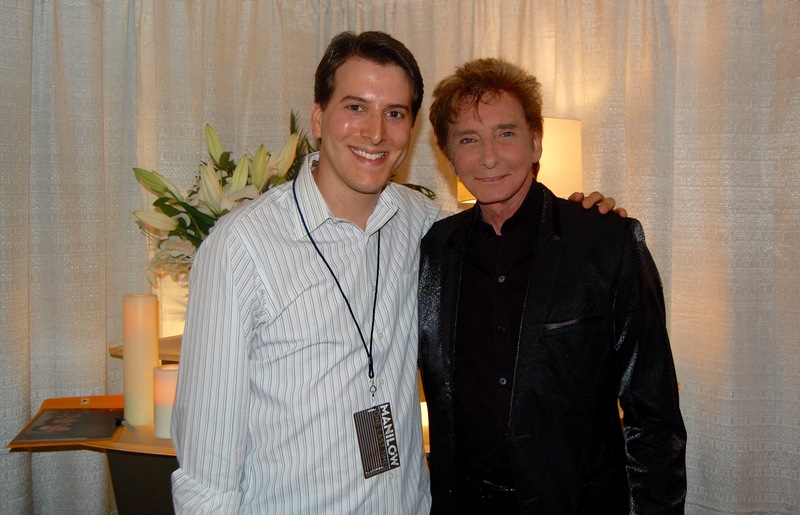 When I met Barry in LA I asked him if I could interview him for my blog. 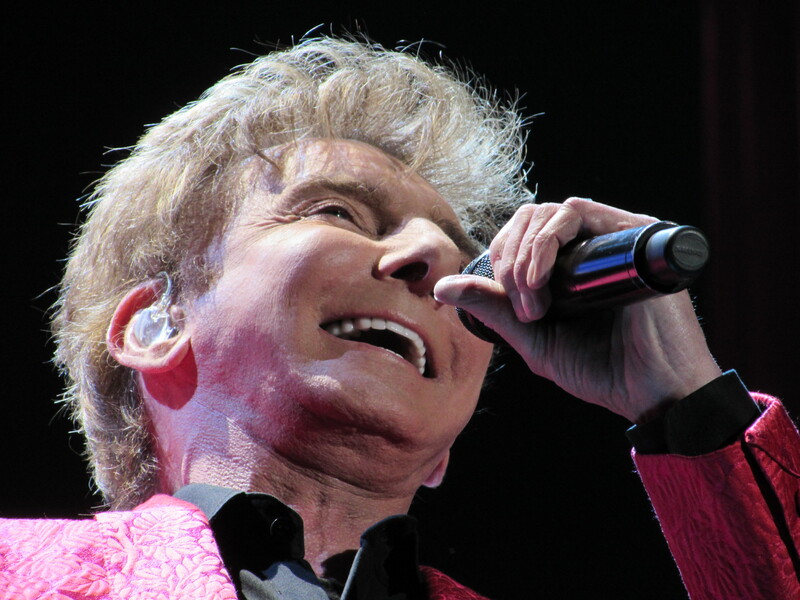 I figured since I’ve interviewed Dionne Warwick and Melissa Manchester, as well as members of KISS, Journey, Chicago, and Hall & Oates, among others, that he might be open to the idea. Barry seemed receptive to the idea of doing the interview; he just said it depended on his availability. Unfortunately, we were unable to make the interview happen between LA and Philly. Going into this meet and greet, I wanted to hand him my questions so he knew exactly what I was going to ask him. I didn’t want Barry to think I was some gossip columnist looking for dirt or that I’d ask him something that would make him feel uncomfortable. I care solely about his artistry and impressive career – that’s it. So I typed up my questions, put them in an envelope with my contact info and slid it into my back pocket. 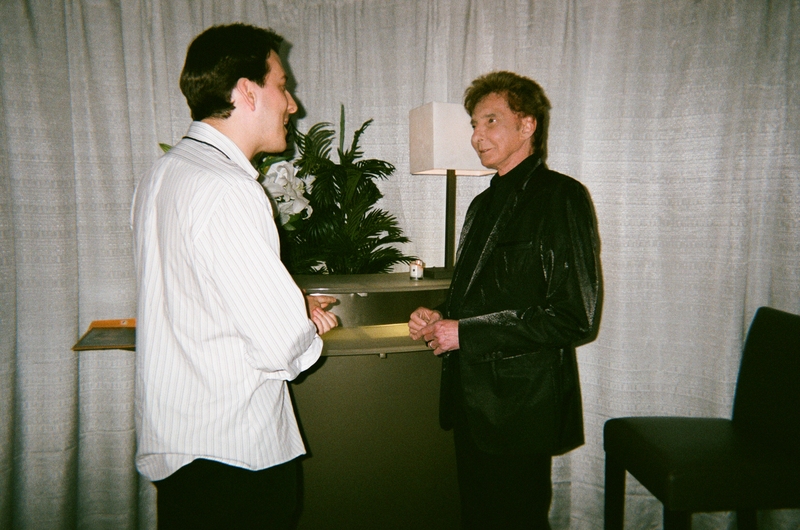 I also had the photo of Barry and I together in LA for him to autograph. I slid a black Sharpie into my other back pocket, took a deep breath and walked into the room to meet him. Kirsten introduced me to Barry and reminded him that we met a few months ago in LA. I showed him the photo of us together from the last meet and greet and mentioned that “my Dads were thrilled to see it featured in the Philadelphia Daily News” a few days prior to the show. If you haven’t read this story, check it out here. 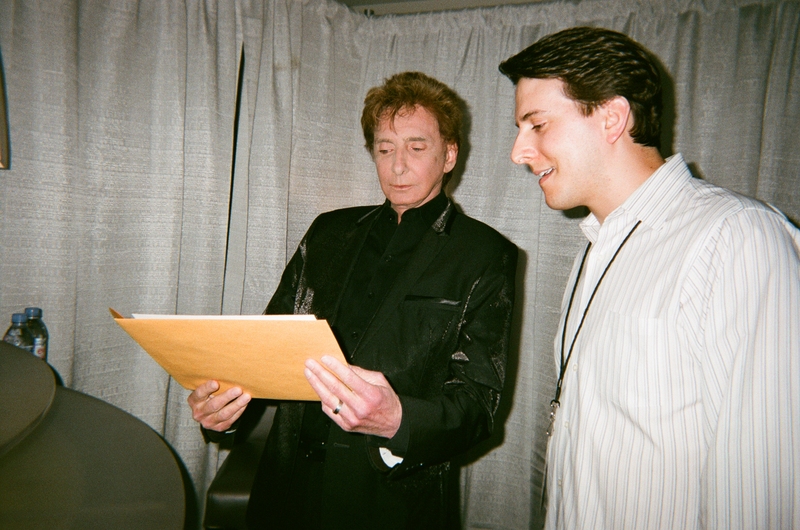 Barry looking at the photo of us together in LA before autographing it. I then nervously pulled the questions I had for Barry out of my back pocket. I reminded him of his interest in doing an interview with me and said, “I understand that you have an extremely busy schedule. But if you should get some free time over the summer, here are the questions I’d like to ask you.” With a smile Barry said, “Boy, you’re a resourceful one.” And he asked me who I write for and I mentioned my blog and that my work has been picked up by Reader’s Digest, ABC News Radio and other top outlets. He then handed my questions to his assistant, Marc, so he could hold on to them. Then, for some reason, Barry asked me if I was a musician. I said, “No. But you inspired me to take singing lessons. 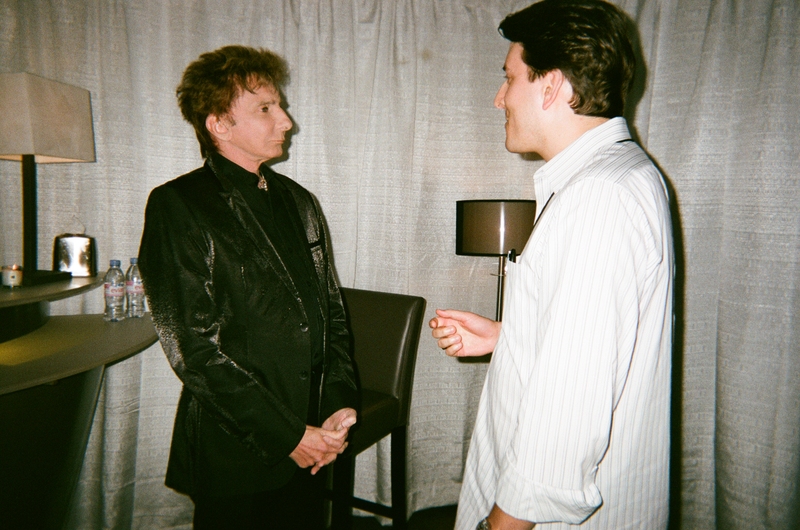 And as a matter of fact, I told you this the first time we met back at a CD signing for 15 Minutes at Radio City Music Hall in New York City.” I continued by saying, “When I first walked up to you that day I remember you saying, ‘Wow! It’s like looking in the mirror and seeing myself in my 20s! '” Barry quickly responded to this story by saying, “Yeah, except you’re a whole lot more handsome than I was!” We laughed and I thanked him for the compliment. Barry then said to me, “Let’s take a photo.” We turned toward the camera, put our arms around each other and smiled for the photo. Thankfully, my eyes are open and I have nothing in my teeth in the photo. And Barry seems even happier in this photo than he was in the last one with me. It really turned out great. 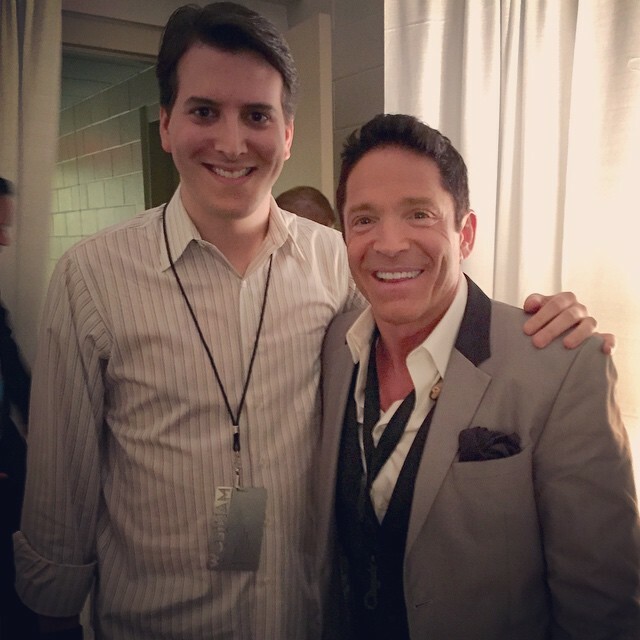 I should also point out that I was lucky enough to meet Dave Koz before the show. Dave was the opening act for this tour and by being backstage, I had to forgo seeing his performance. However, he was nice enough to pop in to meet Barry’s Platinum fans. It was an unexpected and pleasant treat. I mentioned to Dave that him and I were quoted in the Philadelphia Daily News article and he remembered my name from the piece. He was very nice. By the time I got to my seat, Barry was about to hit the stage. 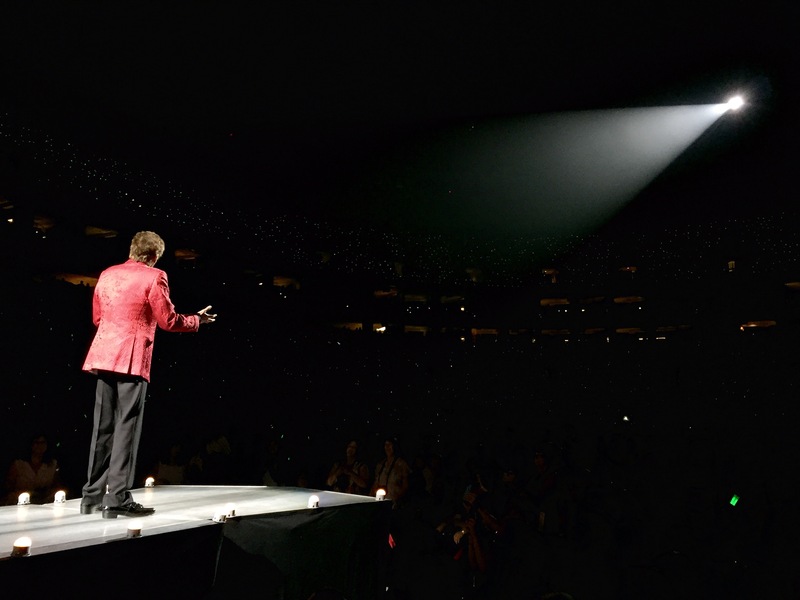 The music started up, the curtains parted and Barry stepped out of a shining light to a deafening roar. The setlist was very similar to the one in LA, just with less obscure songs. While it was more predictable because I had already seen him once on this tour, it was no less enjoyable. Barry sang hit after hit, keeping the crowd on their feet for nearly the entire show. Whether it was “Weekend in New England” or “Let’s Hang On,” the crowd was along for the ride and loving it. Perhaps, my favorite performance was “Even Now” because of the beautiful lyrics, heartfelt delivery and stunning finish. 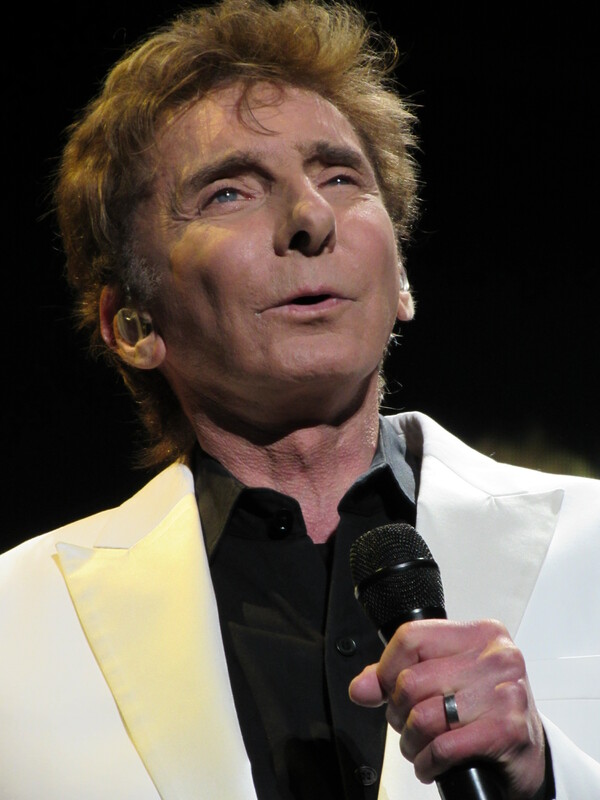 The fact that Barry is capable of performing at this high a level at 72 is astounding. The big question coming out of this experience is, will I get to interview Barry? Who knows. If I do, great. If I don’t, that’s OK. I met the man twice and saw him live three times in a 12-month period. Whatever happens, I’m an extremely fortunate person who’s grateful for what I’ve experienced. And I’m thrilled to hear that my One Last Time! may still be yet to come. I really enjoyed reading that Michael. I hope you do get to interview Barry at some time in the future. It would be a great interview no doubt. Thank you so much for sharing your story, great photos and video with us. Such a treat! Thanks, Wendy! I really appreciate it. 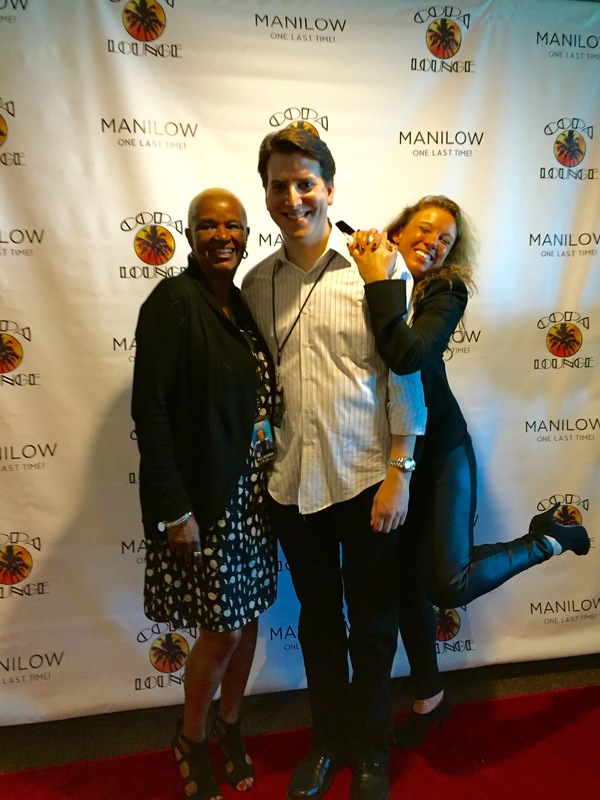 Michael….Great blog of your Platinum Experience with “The Man.” I have all the faith in the world that you will be getting that interview someday soon. Just be patient!! Thank you, Alan! I hope you’re right. Michael…Like Barry, I’ve been alive forever too, and I NEVER say NEVER to anything!! Loved reading all about your meeting with Barry. I really do hope you get that interview in the near future. Thank you for sharing. 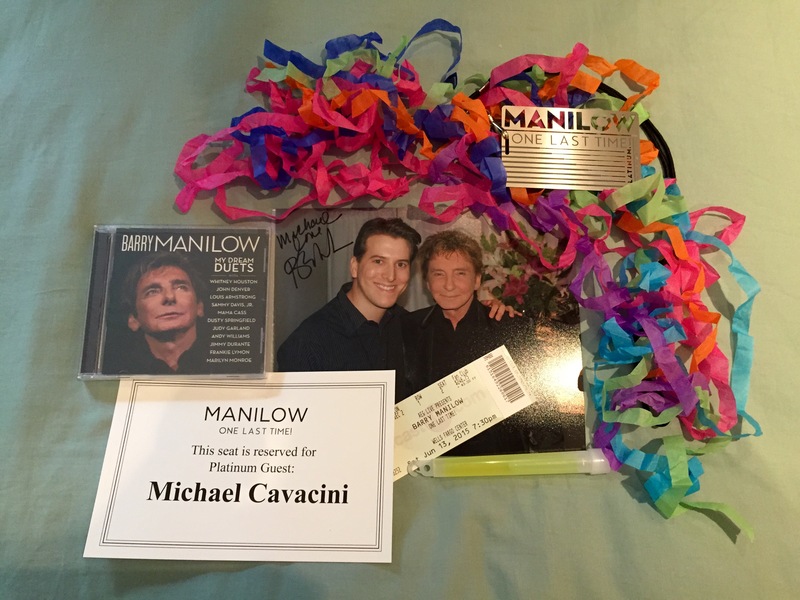 Michael- Thank you again for sharing this precious experience with those of us who wish we could be in your shoes. For me, I read your last shared experience and it brought tears to my eyes. As I just read your message and listened as Barry sang “Even Now”, it was even more meaningful. “Fanilows” love and cherish him . Thanks so much, Lynda. I hope you get to meet Barry soon. Michael, I know that you are very professional when you interview people. You don’t make them uncomfortable or ask flippant questions. They are always respectful, intelligent and insightful. Hopefully, Barry will see that in you and will do the interview soon. I love how you “get” Barry and love his music.. If, no when, he does the interview, I’m sure he will be very happy with the result. Loved reading your review along with all the pics and the video! Here’s to Barry doing that interview with you! I’m sure he won’t be sorry that he did! You are great at what you do! So happy we met and can share our love for this great musician! Hope to see you on the road again real soon! Thanks, Deanna. The feeling’s mutual. Love it Michael! You’re the best! Michael you made my day. I have seen barry several times and he only gets better. I so appreciate your sharing this and the pictures are just awesome. He is truly a legend and his music has touched so many over the years. I truly hope for that interview again you deserve it! The man is truly a wonder! You are a natural. Your friendly writing style sets just the right tone…and I enjoyed this post. Looking forward to more, and hoping that your interview with Barry will take place soon. Wishing you much success. Thanks, Dina! I’m glad you enjoyed the post. Thanks for your kind words of encouragement. Michael, your review was fantastic! Your writing allowed me to feel as though I was with you through it’s entirety. My platinum was in 2007 and it was a day I cherish and will never forget. Thank you for sharing. 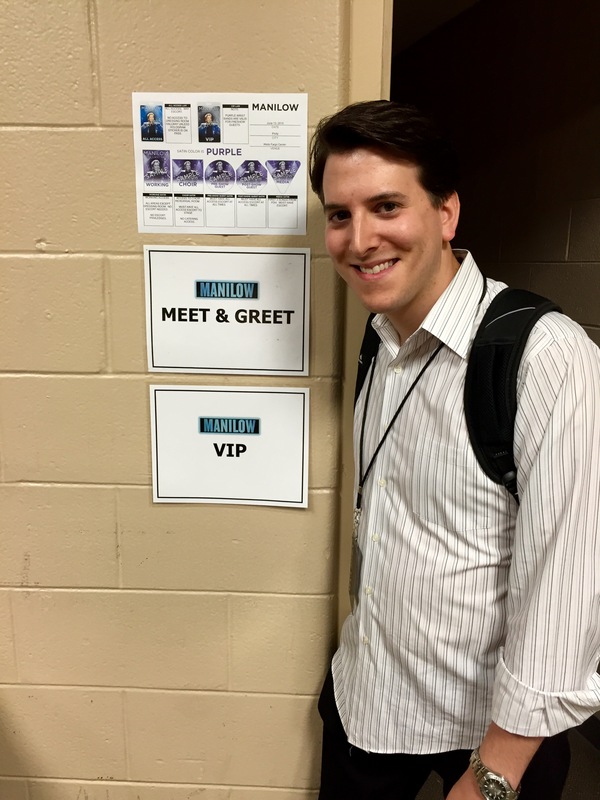 Hi Michael, I read your review on Barry in Philly at the Wells Fargo Center. at the Wells Fargo Center also. I am a fan and I belong to the fan club. my picture is right in front of the title. could you please look up my review under the blogs ? i am also keeping my fingers crossed that Barry will come to Atlantic City !!! video !! I enjoyed that very much. Thanks for the kind words, Noreen. Will do!